Buzzwords like "gluten-free," "antioxidants" and "whole-grain" pepper the grocery store aisles, but do they really mean that such products are healthy? A recent study conducted at the University of Houston warns shoppers to proceed with caution. Researchers say these health-related euphemisms have a powerful impact on consumers and, in light of the actual ingredients in some of these products, could convey a false sense of health. For example, Cherry 7Up now bears the "antioxidant" label, which has become the emblem of anti-aging and prevention of cancer and heart disease. "Saying Cherry 7-Up contains antioxidants is misleading," says Temple Northup, an assistant professor at the Jack J. Valenti School of Communication at UH. "Food marketers are exploiting consumer desires to be healthy by marketing products as nutritious when, in fact, they're not." 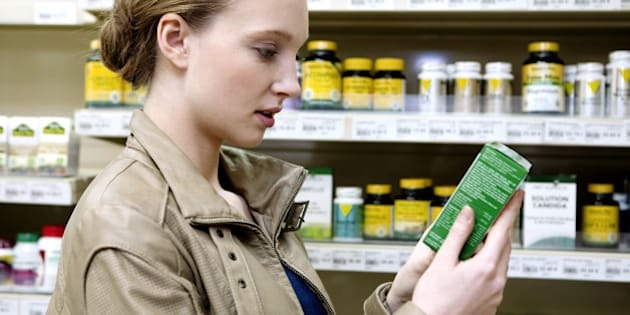 Although the FDA requires Nutrition Information labels in the United States and similar labeling systems are seen in other countries, Northup's research concludes they have little effect on consumers. "Words like organic, antioxidant, natural and gluten-free imply some sort of healthy benefit," Northup said. "When people stop to think about it, there's nothing healthy about Antioxidant Cherry 7-Up -- it's mostly filled with high fructose syrup or sugar. But its name is giving you this clue that there is some sort of health benefit to something that is not healthy at all." In the study, a total of 318 participants were asked to analyze the health aspects of certain products and determine if they were actually healthy for them. Participants were shown labels of the following products both with and without their accompanying "magic words": Annie's Bunny Fruit Snacks (organic), Apple Sauce (organic), Chef Boyardee Beefaroni (whole grain) Chef Boyardee Lasagna (whole grain), Chocolate Cheerios (heart healthy), Cherry 7Up (antioxidant), Smuckers Peanut Butter (all natural) and Tostitos (all natural). Using an online survey, Northup's team showed participants the labels of the products mentioned as well as versions that had the buzzwords removed using Photoshop. They were asked to rate how healthy they thought each product was. According to results, when advertising promises health benefits, consumers respond. "Each time a participant saw one of the triggering words on a label, they would identify it as healthier than the other image without the word," said Northup. Northup's research delved into the psychological aspect of manipulation via word connotations, called "priming," and how it can influence beliefs and inspire behaviours. Indeed, in one phase of the study, participants leaned towards the processed, canned meat product Spam as the healthier option over salmon. Northup says this is an example of how advertising can mislead consumers and that it also indicates a common lack of understanding of the information provided by nutrition labels. He hopes his research will lead to greater media literacy and an enlightened public understanding of food marketing. The study, titled "Truth, Lies, and Packaging: How Food Marketing Creates a False Sense of Health," was published in Food Studies.